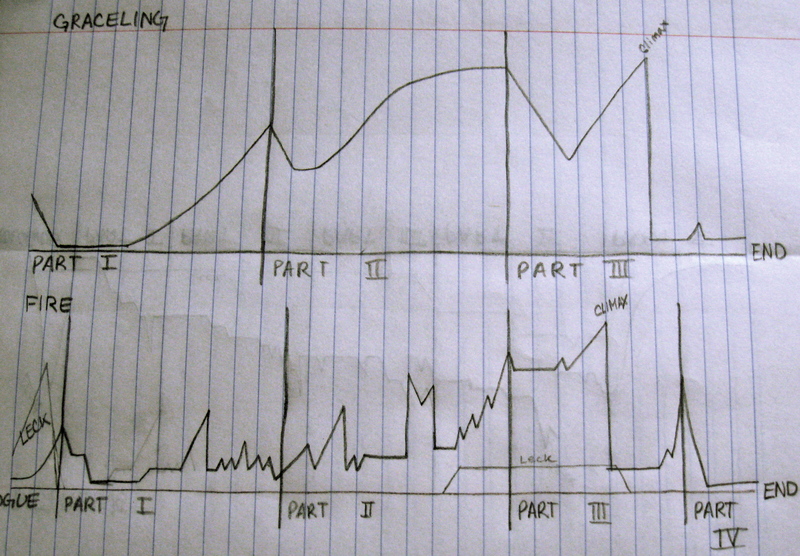 Note: As this is an analysis of a series, please understand that there are spoilers. In March, my best friend told me about a book she thought I would like. 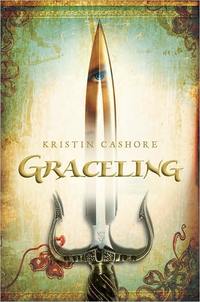 Graceling, by Kristin Cashore, is a fantasy adventure novel about Katsa, a young woman who is “Graced” with a unique ability: killing. I enjoyed it. 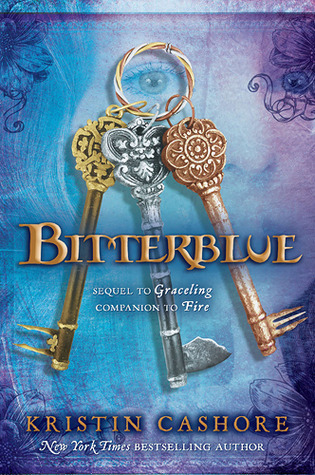 I read Cashore’s companion novel Fire, and just this week my BFF sent me her copy of the recently released Bitterblue, which is the third book in what is now called the Graceling Realm series, and the sequel to Graceling. I like all three of them. I really do. I’ve encouraged others to read them, and I find them very interesting. However, there are two things about them that bother me: Cashore is unable to write a good climax and a good antagonist. As these are two things that I’m struggling with, I sat down today and analyzed what made this so in Cashore’s books. The stories are compelling. The setting is intriguing, the characters are well rounded and entertaining, and the stakes are high, but as the novels progress, they struggle with maintaining suspense and reaching a climax. In each novel, the antagonist is shrouded in mystery, but instead of building suspense, this makes him vague and his actions disruptive to the logic and foreshadowing of the novel. It’s not as if the novels are missing action; they’re not the Twilight books—things happen: battles, murder, theft, betrayal, and discovery. There is conflict. But Cashore becomes too wrapped up in her characters to make sense of her conflict. Each novel struggles with this differently. Graceling does well in building suspense and raising the stakes, but the climax is over so quickly I almost missed it. Fire introduces a villain in its prologue, but he does not appear again until the second half of the book. Again, the climax is over too soon, and the resolution is too drawn out. In Bitterblue Cashore manages to build her suspense at a decent pace, but her antagonist interacts at a distance, and her resolution goes on for seven chapters. In Graceling, Cashore followed the standard formula for the story: exposition, rising action, climax, resolution and denouement. In Fire, however, she doesn’t build the suspense. There are many chapters where things happen—they just never really amount to anything. In Bitterblue, the suspense grows as the novel progresses, but the story hits many plateaus. One thing that Cashore does in all three novels is that she uses the same villain. Leck is a Graceling like Katsa, but his grace is his ability to lie. He can deceive people with his words and make them do whatever he wishes. In Graceling, as it becomes more evident what Leck can do and how he’s using it to hurt people in terrible ways, it’s obvious that in the final confrontation, Katsa will have to find a way to defeat him before he can use his Grace on her. As the reader, I was expecting her to outsmart him. I was expecting a dramatic confrontation, one that pitted Leck’s dialogue against Katsa’s actions. The man no one can resist and the woman no one can kill. And it starts out promising. Leck ambushes Katsa and his Grace is at work on those around him. Then Katsa launches a dagger at Leck. It strikes him in the face and kills him. The villain is dead, his Grace lifted from the minds of the people around her, and his daughter Princess Bitterblue is made queen. The actual act of his death is quick. It’s too quick. The climax didn’t live up to my expectations from the suspense And after that, there are four chapters and an epilogue in which Katsa travels home, finds her lover, makes a discovery that was a little obvious, and then has a happy ending.I kept thinking that something else was going to happen – there were five chapters! But nothing really did. I can see the logic of it, but I still feel cheated out of a good fight. Leck returns in Fire. 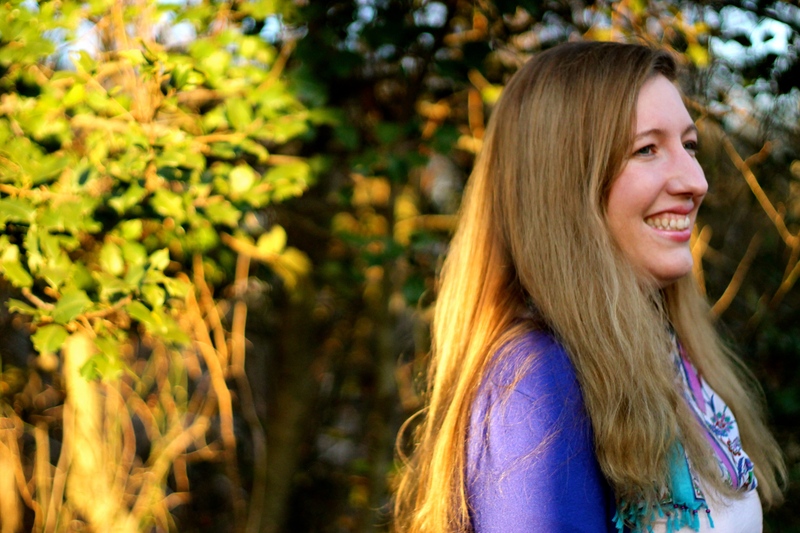 Fire is set in a different part of Cashore’s world, and at an earlier time. There are no Gracelings (save Leck), but there are monsters. Monsters are humans and animals more beautiful and more powerful than the average person or beast. They have the ability to manipulate minds, and they are the objects of desire. And not in a good way. Fire is a monster, the last of the human monsters, and she is repeatedly approached by men and women drawn to her beauty. However, they either want to possess her or destroy her. 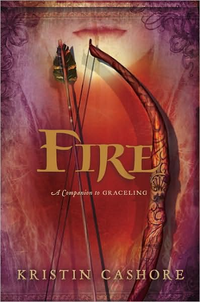 Leck appears in the prologue to Fire—some decades before the events of Graceling—and it is there that the reader learns more of who he is, where he comes from, and the extent of his Grace. Then he disappears for the next — chapters. Things happen between the pages of Fire, but there is no strong antagonist other than Fire’s own insecurities and perception of the world. When Leck kidnaps Fire, it’s a little ridiculous: he’s only a teenager, and he acts like one too. He’s scary, but I think he’s only scary because I had read Graceling. Leck’s sudden removal from the novel again upsets what could have been a great climax. His too short interaction with Fire results in several pages of Fire brooding and grieving while she shuts out everyone around her. A final, terrible event occurs at the end of Part III, but within a few paragraphs of the following chapter everything is smoothed over, and there’s a happy ending for all. Bitterblue is a little better than Fire. There’s more mystery and suspense. The story is set in the same world as Graceling, but it’s been years since Katsa killed Leck, and now his daughter Bitterblue, whom Katsa saved, is queen of Monsea. She struggles with her responsibilities, and it becomes evident that her advisors are hiding something from her. Bitterblue becomes obsessed with learning more about her father and what he did during his reign. Leck is an even more powerful force in Bitterblue, but again there is no clear antagonist. In fact, there are about six, and three of them are so passive that even though their actions hurt Bitterblue, they do not really affect the story. One is present in what I determined was meant to be the climax, but a climax means that a change happens. There is none. (All right, I guess losing your virginity is a change, but it doesn’t fit with the suspense of the story, and to be perfectly honest, by that time I was disgusted with Bitterblue’s choice. He wasn’t good for her, and she knew it, and I don’t care if someone close to her had just died, and I don’t care if the guy she jumped into bed with was conveniently there and conveniently the only male close to her age whom she ever interacted with, she was too noble in character to be that base. It was rebellious, and it didn’t do her any good. Cashore writes great characters. She has an excellent command of voice, and her world is beautiful and savage. There are a lot of things that I really admire about her novels, and I’ve tweaked a few things in my own story because I’ve been inspired by her. I still really like the books. I think they should be read. Maybe I just ruin books for myself by overanalyzing them. This entry was posted in Inspiration, Novel Review, Review, Writing and tagged Antagonist, Bitterblue, Climax, Fire, Graceling, Kristin Cashore, Plot, writing. Bookmark the permalink. ← Hey! HEY YOU! Listen to this! Very interesting. It sounds like I ought to read these in order to understand that danger, because it is one I struggle with in my own stories.